This article provides some tips and tricks to help turn your Tinkercad design into a full-fledged 3D-printed enclosure. 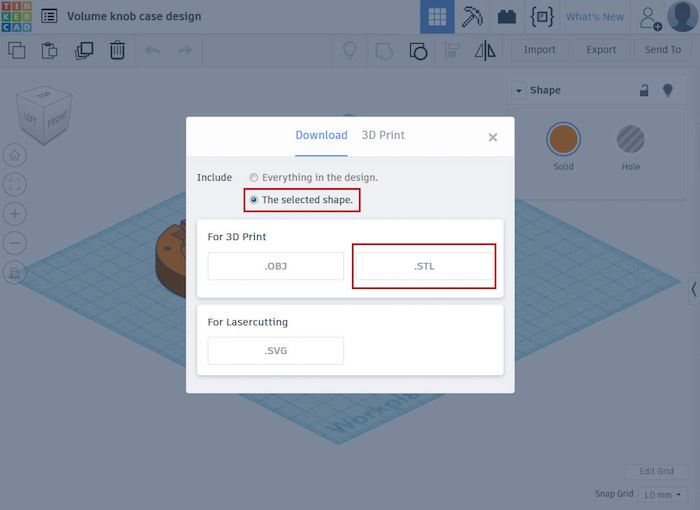 In this tutorial, a followup to Introduction to Tinkercad, I'll be preparing my Tinkercad design for 3D printing, offering up some tips and tricks for the process, and covering how to finish and finalize your creations. If you're new to Tinkercad, I recommend you review the introduction before moving on to these next steps. When designing a part that’s going to be 3D printed, you should always keep the limitations of the manufacturing process in mind. Overhangs, for example, can not be printed precisely without support structures and the printed part will almost always shrink a little bit after cooling down. While this effect doesn’t make a huge difference overall, it might have a large impact on small holes, pegs, or other small structures in your design. Some materials, like ABS, are more prone to shrinking than others, like PLA or PETG. There are different approaches to minimize the effects of shrinking. For parts where it really matters, I usually adjust the diameters by half a millimeter for round shapes. Rectangular cut-outs usually don’t shrink that much, so I don’t change these diameters. Therefore you should adjust your workpiece before exporting it for printing and try to plan ahead while designing it to avoid overhanging structures, if possible. Export each piece of your project separately. In the dialog window, choose “The selected shape” and export it as an STL file. 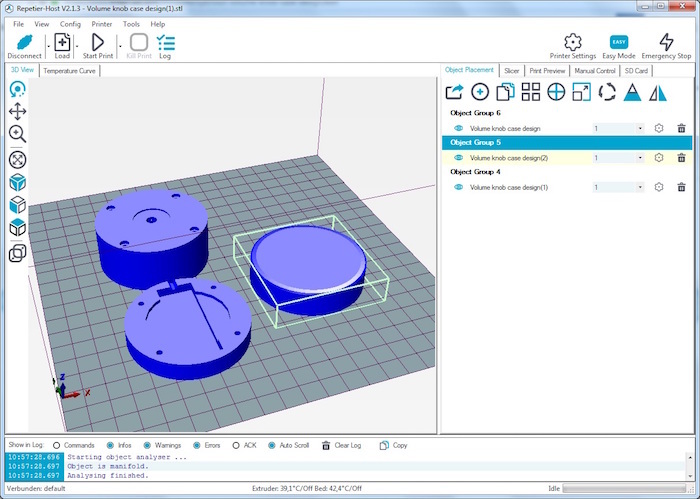 Upload the STL files of your pieces into your 3D printing software. My first tip is to make sure that the largest flat surface of your part touches the print bed. This will help to put the first layer down. Rotate your shapes so the largest flat surface of each part touches the print bed. When slicing the objects, make sure to use an appropriate infill percentage and pattern. Parts, that won’t have to deal with great physical forces, like this case, don’t need that much infill. I’d go with 20 to 40% and a honeycomb pattern. This way you won’t use more material than necessary and the print time gets reduced significantly. Using support structures can almost always be avoided by rotating the objects. However, if it is simply not avoidable, don’t forget to turn them on. Supports will make sure that overhanging structures with an angle greater than 45 degrees can still be printed cleanly. I usually try to avoid them at all cost, because it means more work when cleaning up the finished print. Don’t forget to set the appropriate temperature for the material you use. Usually, you want to use between 230 and 260 degrees Celsius (445 to 500 Fahrenheit) for ABS, 185 to 200 degrees Celsius (365 to 390 Fahrenheit) for PLA and 220 to 245 degrees Celsius (430 to 475 Fahrenheit) for PETG. If you have a heated print bed, turn it on to roughly 70 to 80 degrees Celsius (160 to 175 degrees Fahrenheit) and you should be fine with the settings in the print software. 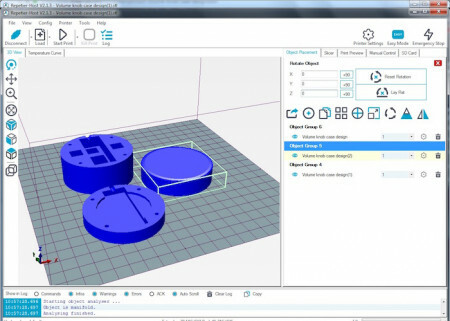 If you don’t have a heated bed, you can turn on rafts, which might help your prints to better adhere to the print bed. You can also use different methods, like Kapton tape, to allow prints to stick. After everything is heated up, I usually use a simple glue stick to apply a thin layer of glue to the heated bed. Applying the glue once will usually be good for several prints. When your prints won't stick down anymore, re-apply the glue. You can do this until the glue layer gets too thick (leaving behind a residue). Then simply clean the heated bed with window cleaner and reapply a thin layer of glue. I use a water-based glue that is more or less chemical free to reduce harmful fumes while printing. You should try to only print in a well ventilated area. Start the print and carefully watch the printer lay down the first layer. This is the point where prints fail most of the time. When this layer doesn’t stick, the material gets pushed around and might clog the printing nozzle. When the nozzle clogs, make sure to turn the motors off immediately. I usually hit the reset switch, which will cause the printer to stop but will keep the fans running, so the components don’t overheat. If you continue to have problems getting the first layer to stick, try cleaning the print bed. Make sure it’s grease and oil free and try lowering the print speed. Stay with the printer until the first two to five layers got put down properly and then stay within reach and check back every 10 to 15 minutes and adjust the settings if necessary. After your parts are printed, you might need to put some more work into them. Check that all the dimensions are good first and make sure your parts fit. If they don’t, adjust your design in Tinkercad. After making sure that your part has the correct dimensions, break away all the support structures. You can either do this by hand or by carefully using a screwdriver or knife. After all the supports are gone, you might have to rework some parts of your printed piece manually. The most common thing that needs to be reworked, are holes in the printed parts. Screw holes are a good example. If your screws don’t fit after the part cooled down, you can use a drill (or other tools) to widen the holes or adjust the diameter in Tinkercad and print the parts again. Because the material is very soft, you can use a screwdriver or the screw itself to make the holes bigger. However, if you attempt to widen the holes too much, the material might break. You can also use sandpaper to take away material if the diameter of your printed parts is too large. Make sure to wear protective gear when doing so, because you don’t want to breathe in the fine dust. This method can also be used to give the prints a matte finish. Tinkercad makes it very easy to design things without having extensive knowledge of CAD software. However, this simplicity also means that it is not suitable for highly professional applications. And while 3D printing can be tricky, especially in the beginning, you will eventually figure everything out. Use the tips and tricks from this article as a starting point and try experimenting with your equipment and adjust settings as needed. You’ll be designing and printing complex objects in no time! Got any extra tips and trick? Let us know in the comments below!